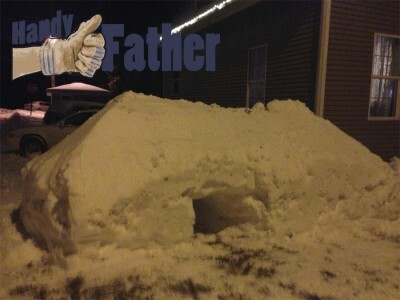 Kids love snow forts; Handy Fathers easy snow fort building. It conserves energy and keeps them kids happy. We have had about 8-10″ of fresh snowfall in the last day, and another 4-5 days of cold weather ahead, so we were out and about in the snow all day today. Since the driveway needs shoveled anyway, combine that task with easy snow fort building by shoveling all of the snow into a single pile. Sure, it’s easier to shovel in the shortest path, but with a little extra effort, you can get a large snow pile, perfect for making an amazing and easy snow fort. Snow fort step 1: Get yourself a good snow shovel that you can use and get the job done without being too tired. A plow style shovel is my favorite because I can push the snow more than pick it up. Snow fort step 2: Find the best place to dig a tunnel in the pile, and have at it. My kids love the tunnel-style snow forts. Make the tunnel big enough for your biggest kid, all the time adding the tunnel snow to the pile to make it even larger. Once the tunnel is half-way through the pile, go to the location of the exit, and tunnel through to the center. Snow fort step 3: The tunnel is complete, and now it’s time to make it look like a fort on the outside. This is accomplished by shoveling vertical walls into the outside of the pile of snow, making it look like a built building. For an added effect, smooth the top at angles to make it look like a roof. The kids with have a great time in this easy snow fort. You won’t break your back but you might feel like it is broken tomorrow!